In 2011 the author was approached by the Australian Society for Kangaroos to review documentation and supporting correspondence surrounding an approved authority to shoot 300 Eastern Grey Kangaroos at Northern Lodge, an equine studies facility attached to the North Melbourne Institute of TAFE (NMIT). The review prepared is attached as Attachment 1. 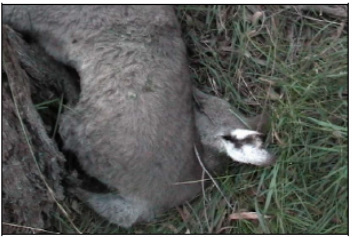 In summary the NMIT shooting program shows a casual disregard for the scientific process, there is no evidence based decision making, there is no consideration for the welfare of affected kangaroos, and sustainability generally, on behalf of NMIT, their consultant, and the Victorian DSE. While the NMIT shooting occurred in Victoria, it is relevant to this nomination as an example of how kangaroos are managed generally in Australia, when a land manager sets their mind to the destruction of native wildlife. The fact that it seems that any piece of paper with “Kangaroo Management Plan” emblazoned on the front will provide for approval to harm wildlife from regulatory offices, seems to be a cross-border phenomenon. A doe lies twisted where she fell when shot.